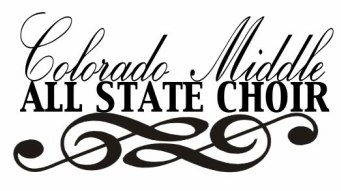 Students are expected to have all their music learned and memorized when they attend All State Choir on February 4th and 5th, 2016. It is the student's responsibility to learn their music, but it is also the DIRECTOR'S responsibility to ensure their students are prepared prior to attending All State Choir. To aid in the rehearsal process, we have professionally recorded rehearsal tracks available below. Notes For "Sarah:" If Possible, Tenor 2's please learn the Bass 1 part. If Bass 1 part is too low, then learn Tenor part. Notes For "Sarah:" Basses learn either Bass 1 or Bass 2 part, depending on individual student range. If student has low notes to sing Bass 2 part, then he should learn Bass 2. Notes for "Tshosholoza:" See Acceptance List for Divisi Assignments. If you have a students assigned to Bass 2 that cannot comfortably sing the Bass 2 notes and need to switch him to Bass 1 (or vice versa) please email Phil Drozda at pdrozda@cherrycreekschools.org ASAP so we can ensure a balance in the divisi. Also note that Altos sing "Soprano 2" in "Will There Really Be a Morning?" Notes on "Waltz-Solfege Suite #3:" Soprano 2's will be dividing in half between melody and harmony on this piece for balance purposes. Please see the Acceptance List in "Acceptance Information" for student part assignments. Notes on "Spiritual Musick:" Altos divide on the last two pages, see Acceptance List on the Acceptance Info Page for divisi assignments/which track each student should learn. Notes on "The Dream Keeper:" Altos divide in several spots throughout the piece. See Acceptance List on the Acceptance Info Page for divisi assignments/which track each student should learn.